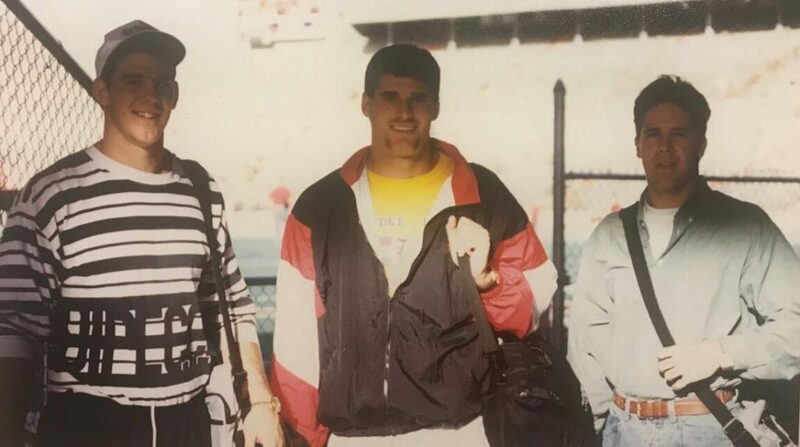 This interview may throw you for a bit of a loop, because it involves not only a rival Kansas Jayhawk quarterback but also a former Cornhusker quarterback. Did I share a simultaneous conversation with two people? No, what you’ll read here is the result of some digging, some searching out and reaching back through the years for a unique glimpse from someone who saw the Nebraska dynasty from both sides of the fence. That one person holding such precious insight is none other than Ben Rutz, a well-traveled man. 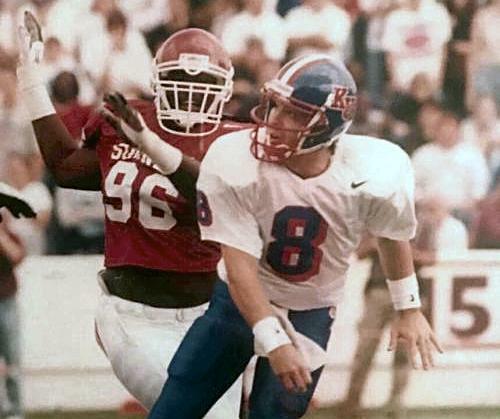 Raised in Oklahoma, playing at Nebraska (’92-’93), transferring out and then finally playing for Big 8 Conference opponent Kansas (’95-’96) to finish out his career, Ben is still the same ol’ guy I recall from his earlier days. A kind and easy-going soul with a nervous itch to enjoin the fracas, the spectre of playing second fiddle to a kid named Frazier was too much to bear so he flew the coop for a higher place of prominence. In the final analysis, I can’t much blame him. Let’s hear what Ben has to share of those days. Question: Hey Ben, hope you’re doing well. Am I calling at an okay time for you? Ben Rutz: Oh, it’s fine. I got the kids to bed and the whole nine yards. Q: That’s the most important thing, eh? Where are you nowadays? BR: I’m in basically Oklahoma City. Edmond, Oklahoma. I’m in medical sales. Bio-Surgery. Oddly enough, I deal with new injections for osteo-arthritis. Q: If I recall, you and the old knees have a unique history, no? BR: That’s right. I’m a good candidate here before too long. Basically it’s one of these injections before the inevitable… that keeps your knees from hurting before you get too old. 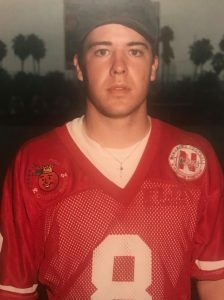 Q: So tell me, how the heck did an Oklahoma kid end up as a quarterback at Nebraska? BR: Well, at the time it was the Big 8 – I guess it didn’t turn into the Big 12 until, what, ’96? – I actually ended up picking Nebraska. 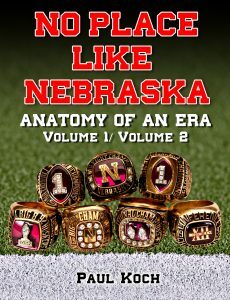 As far as Nebraska recruiting me down here, there wasn’t an awful lot of folks from Oklahoma had gone to Nebraska there. I guess the year I came in it was me, Mike Minter and a running back by the name of Willis Brown. We all committed that same year to Nebraska, which was pretty much unheard of. Because you’d pretty much never hear of someone from Nebraska going to Oklahoma and someone from Oklahoma going to Nebraska. BR: He pretty much was. And Will was from the same high school Mike was from. Coach Osborne and Nebraska started recruiting me pretty early as a sophomore, I guess. And you get in that whole deal where you get in that recruiting cycle and you get to know a few folks a little better and you get more comfortable with certain people. And being from Oklahoma at that time, OU wasn’t exactly… it didn’t seem like the best place. Coach Switzer had been kind of ousted a couple years before that and you didn’t know what was going to happen from one year to the next. Q: Were you an OU fan? BR: Yeah, and it was kind of weird for me: I was an OU fan and an OSU fan. It sounds kind of odd, growing up here. But I grew up going to OSU football camp every year. And again, you go there since you’re nine or ten years old and you get to know Jimmy Johnson from all those years and Pat Jones from all those years and their staff. And of course, OU is OU. I think OSU was probably the hardest place when recruiting, to make that phone call and tell them I wasn’t coming there. But Coach Osborne, I think that getting to know them and going to one of their camps… and speaking of Coach Osborne, it’s hard not to respect the guy, and that’s a big part of it. That staff there was the big difference with them and other programs. Of course, that was a big change, what they went through after Coach Osborne was done, every single one of those guys had been there for so long. And I think that’s why they were so successful year in and year out, and it starts with Coach Osborne. He kind of stuck to his guns and worked with what he’s got. And I think his character alone had to be one of the big plus’s during all those years. Q: Who was your main recruiting contact back then? BR: Oh, good Lord, it was Tony Samuel. 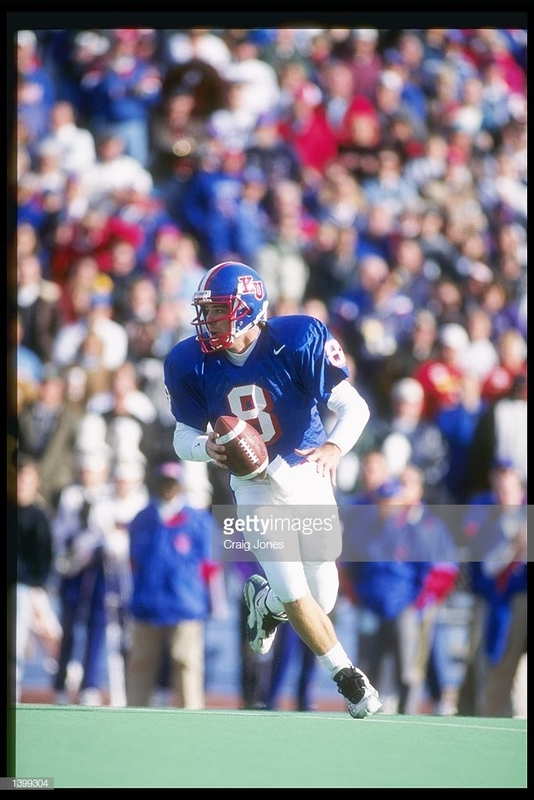 And then, in fact, in the middle of recruiting I had Turner Gill recruiting me to SMU. Q: That meant he liked you. (laughs) So what was your first year? BR: My first year would have been ’92. Q: So you come in, you’ve been to football camp and on a recruiting visit to Lincoln already; anything interesting about the first few days when arriving on campus as a freshman? Q: Do you recall the first guy you befriended? BR: Well, my first two had come up that summer and I had lived with them, two guys: Jim Steibel from Illinois and Mike Minter. Mike used to ride up with me here. I had a car, so his folks would bring him up from Lawton and we’d go from there. Then there was Scott Saltzman. He was from Rider in Wichita Falls, Texas. That’s Aaron Taylor’s hometown, too. We took him out on his recruiting trip. And of course, Vrzal ended up being one of my best buds. Q: Good old Vrz! Love that guy! BR: Of course, when we finally started freshman two-a-days he came in as a big old, round body, playing center. He was in my wedding, the whole deal. We still keep in touch. He did that old P90X and introduced me to it. Q: You spent enough time in the weight room and training room rehabbing, right? BR: Yeah, I blew out my first one at Nebraska and then I blew the other one out when I was at Kansas. Bryan Bailey was always my favorite guy there. He really knew his stuff. Q: So your position coaches were Coach Osborne and Gill. What in particular stands out about those guys? BR: You know what, I think they were both a perfect combination if you’ve got Coach Osborne coaching quarterbacks. Their personalities fit pretty darn well. BR: A little bit. I think they were a lot alike in a way, but of course Turner being the young buck had a little more fire. Of course, most people had a little more fire than Coach Osborne. (laughs) He was the kind that spoke softly, but people listened. Being a soft speaker, he kind of demanded your respect in an odd way. Q: So your knee injury… was that your freshman or redshirt freshman year? BR: I redshirted and then started freshman spring ball and actually had a pretty good spring, and one of those Saturday scrimmages I blew it. Q: You were pretty much holding your own at the time, no? Q: No favorites, so to speak? BR: No, I mean, of course, that’s going to come into play regardless. But that was one thing that was pretty neat. Every single play, whether it’s handing the ball off, throwing the ball, they’d grade you on every single thing. And of course, you’d get your grade and compare it to yourself that day and against the other quarterbacks. I think that particular scrimmage, that was kind of exciting. I actually started the scrimmage that Saturday and I was looking pretty good, but of course the rest is history: I blew my knee and moved on. Q: Geez! So you rehabbed the knee. And when did you decide to transfer out? BR: I rehabbed immediately after that in the spring with old Doak for the summer. I stayed there and tried to get it done. I ended up playing sparingly here and there the following year, mostly mop-up stuff. But, of course, then I was young… and who knows whether I made the right decision or not. At least I know now, if I ever have a child who goes through the recruiting situation, at least I’ll have been there and can give good advice. At that point, as far as Tommie having his sophomore year, he ended up taking over things and looked pretty good. My whole recruiting situation to go the Nebraska was to throw the ball. For Nebraska that was kind of their recruiting tool for me. And Nebraska at that time was looking pretty salty running over people and throwing it here and there, but when you’d get to a bowl game against those teams that were extremely fast, at least that was their recruiting and trying to get me, and I thought that sounded pretty good. They thought we had to throw the ball to compete with those teams. Q: Kind of one of those things where to “keep up with the Joneses, you have to become the Joneses”? BR: Yeah. But then I had all this other stuff happened and Tommie took over, and that’s why I ended up getting a little anxious. Of course, at that time Nebraska was getting the cream of the crop, and you go year to year expecting to start. And then as time goes on and you’re not and then you start getting a little anxious, so there kind of came a time when you have to make a decision at the end of that year after the Orange Bowl and all that stuff. Q: Was that after the Florida State Orange Bowl, the 18-16 loss? BR: Yeah, we played Florida State two years in a row: my redshirt year and then my freshman year. My last game was that one with Charlie Ward, the close one, the year he won the Heisman. Q: So you’re on the sideline for that game. Any recollections of that game for you? BR: My personal memory of it was that we practiced that week and that I could possibly have a chance -that I might get into the game- after getting a lot of reps that week for throwing the ball. I rehabbed all year, and we had that in our game plan where we stick with what Tommie does best and stick it out, but if for some odd reason that didn’t work out and we had to sling it around the field, then I possibly had a chance of getting in. Q: Bring out the guns and start slinging, eh? BR: Yeah, well, sort of. I tell you what was impressive -in my opinion- that was one of the best games I’d ever seen Tommie play. He played a heck of a game, because he ran and he threw, the whole nine yards. It was really impressive. Q: So after that game is over, you pretty much said to yourself, “Tommie has this position locked up if he keeps playing like this,” huh? BR: Yeah, but of course that wasn’t a hidden secret through that year. He had a heck of a year. And you just kind of come to that decision of, ‘Do I want to play sparingly?’ Of course, I’d never want to sit and watch somebody else in there, that’s not the case. Q: So I hope I’m not dredging up any painful memories, but how did you decide that Kansas was the place to go to? BR: Well, I actually ended up going to a JUCO. Yeah, JUCO for one year, and went to Northeastern Oklahoma A&M. Q: How did that go? Back on the field playing a lot again and feeling pretty good about things? BR: Yeah, I got back and was playing a lot -and of course that’s kind of the risk you take doing that- because you better perform and you better not get hurt. And then you have to go through the recruiting process all over again. That was something to weigh in on the decision making. And we lost the national championship game in overtime. We were playing Trinity Valley. BR: Yep, it was fun. We had a blast that year. That was part of that decision: if I was going to do something you wanted to try to get somewhere for that January, so you could enroll and play spring ball and get acclimated at the new school. It worked out okay. Q: And it just happened to be the state you grew up in? BR: Yeah, NEO. I don’t know if you’re familiar with them or not, but over the years they were kind of the Notre Dame of JUCO’s. Nationally, they were impressive. You showed up there for two-a-days and you’d be amazed. There were kids coming there from all over the country trying to make the squad. It was one of those programs kind of made known that if you made the squad there was a pretty good chance you were getting a scholarship somewhere else down the road. Q: Did you get many questions or much buzz about being the ‘Nebraska guy’ joining the team? BR: Yeah, I think there was. But at the time there was a lot of guys who had a background; guys from Mississippi State, Alabama, guys that could have gone anywhere in the country except for grade issues and things like that. Q: So I’ll bet you had some interesting conversations with guys? BR: Yeah, absolutely. 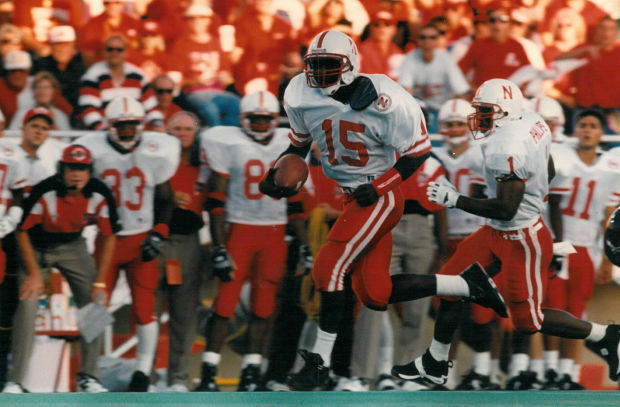 At that time they would ask you what it was like at Nebraska and that type of stuff. Q: When you got that question what would your typical response be? BR: I always had nothing but positive responses as far as being at Nebraska and my experience, aside from my obvious injury and the competitive nature of the situation. Other than that, if you want to play big league football and be in a big league program it just doesn’t get much better, you know?